The Razer Taipan is a high DPI ambidextrous gaming mouse. You can use the mouse whether you are left handed or right handed, which is very rare for most gaming mice. Similar to the Razer Mamba and Abyssus the Taipan features a very simple ergonomic design, fitted to suit many different grip styles and sizes of hand. During extended periods of gaming use, the mouse still feels comfortable and does not provide discomfort to the user. The mouse features not one, but two sensors on the underside. One sensor is optical and the other laser. When pairing these two different sensors, it allows the mouse to calibrate itself and adjust to different surfaces, therefore this mouse does not require a mouse mat, and can simply be used on any desk or surface. The laser sensor is 8200DPI and can be easily adjusted with the DPI adjustment buttons, allowing you to switch between higher and lower DPIs. The accuracy is very high with this mouse and really allows you to accurately pinpoint a target right to the exact pixel, and make sure you are landing those correct shots in your FPS games, or selecting the right targets in your point and clicks. The Taipan features lift-off tracking to halt any jitter of the cursor on screen when moving the mouse from the surface. The Taipan is perfectly symmetrical. It features two buttons on either side, allowing the mouse to be ambidextrous. Whether your hand is shaped like a south-paw or a claw, you will be able to use this mouse with little to no issues. The DPI buttons are situated perfectly, and easy to get to along with the scroll wheel. The two side buttons can sometimes cause an inconvenience with hand placing, however, over time you slowly get used to them. The design is very simple, and will not take long for any gamer to adjust to, with both sides featuring a thumb contour and a very narrow design, you can easily use this as a left-handed gamer. Green LED lighting is featured behind the scroll wheel, and also under the Razer logo. Luckily this mouse won’t require tons of driver installations or software installations to get it working. The Taipan is plug and play, making it extremely easy to use on any machine. Of course, you will want the Razer Synapse software as it will allow you to customize features on the mouse from lighting to programmable keys. The USB 2.0 cable is 2.1 meters, which is a very long cable, so you won’t encounter any short cable issues when connecting it to your device. 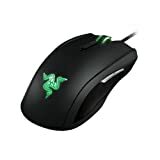 The Razer Taipan is an ambidextrous mouse which gives it massive credit already, as left-handed mice are rare. It features a high DPI dual sensor and a narrow sleek design. It was very accurate in FPS games, with a low response time.